A 1-8 bowl record isn't going to help the Pac-12's perception at all. To say that the Pac-12 had an underwhelming bowl season would be like saying that Nick Saban has been a good coach for Alabama. It’s technically true, but it’s such an understatement that it actually gives a false impression. The Pac-12 did not underwhelm during bowl season. It belly-flopped so badly that fans should be scared just looking at a diving board. The Pac-12’s bowl season in GIF form. It’s not just that Pac-12 teams lost bowl games. That happens. Random variability means that conferences will lose more than they win every once in a while. It happens to every conference. You won’t hear it mentioned, but the SEC actually had a losing record this bowl season as well. The Pac-12’s record stands out, however, for two reasons. The first is the sheer number of losses. A 1-8 bowl record is the worst in history for a conference playing more than five bowl games, and the worst bowl record for a power conference. Second, the manner of many of the losses will hurt the reputations of those teams moving forward. When enough teams in a conference lose their reputations, the entire conference suffers for it. The Pac-12’s lone bowl win came in its second game, as Utah controlled the Heart of Dallas Bowl against a Will Grier-less West Virginia team. Utah actually impressed in that game, but that’s the extent of any positives. Boise State steamrolled Oregon, not letting the Ducks’ high-powered offense do much. UCLA, minus Josh Rosen, couldn’t keep up with Kansas State. Arizona lost to Purdue, a game that most had penciled in as a Pac-12 win. Stanford blew a huge lead against TCU — and while a close loss to TCU isn’t embarrassing, how that game ended will leave people less impressed with Stanford heading into 2018. Washington State was favored over Michigan State, but the Spartans absolutely embarrassed the Cougars. In the big bowl games, Washington and USC did not look quite on the same level as Penn State and Ohio State, respectively. Neither game was a blowout and, just eyeballing scores, both actually looked pretty close. Notwithstanding the fact that Washington had a chance to tie the game at the end after a late comeback, the fact is that both Penn State and Ohio State controlled those games. There’s nothing embarrassing about losing to those two teams, but it did leave an impression that the Pac-12’s top teams were a step behind the Big Ten’s. Again, most of these losses aren’t embarrassing. A bounce here, a cut finger there, and the bowl record could have very different. However, 1-8 did happen. Usually, that wouldn’t be a long-term problem. However, this happens to coincide with another bad trend for the Pac-12. The Pac-12 will come into 2018 a bit down in perception. That always happens after a difficult bowl season. However, the league won’t have many opportunities to make up for that at the start of the season. Between the dozen Pac-12 teams, the league only plays nine Power 5 teams out of conference. One of the biggest of those games, USC vs. Notre Dame, comes in November, well after the country will have formed its perception of the Pac-12. Several schools do play BYU, which in most years is a decent opponent. However, if BYU is as bad in 2018 as it was in 2017, that won’t help much. Moreover, some of those nine games really can’t help with the league. Oregon State and Arizona State face Ohio State and Michigan State, respectively. The odds of either of those ending as an upset are pretty minuscule. On the other end of the spectrum, Cal’s game against North Carolina won’t really move the needle for the conference even with a win. The Pac-12 really has only four early-season games that will affect its reputation. UCLA’s Week 2 trip to Oklahoma could do wonders for the conference due to the arrival of Chip Kelly, but hoping for an upset there might be just a bit too much, too soon. Conversely, USC’s Week 2 game against Texas could really hurt the conference. A convincing win will help somewhat, but exactly how much won’t be known until we see what Texas does for the rest of the season. That leaves just two games to really affect the Pac-12 in 2018. The first is Washington’s Week 1 “neutral site” game against Auburn. 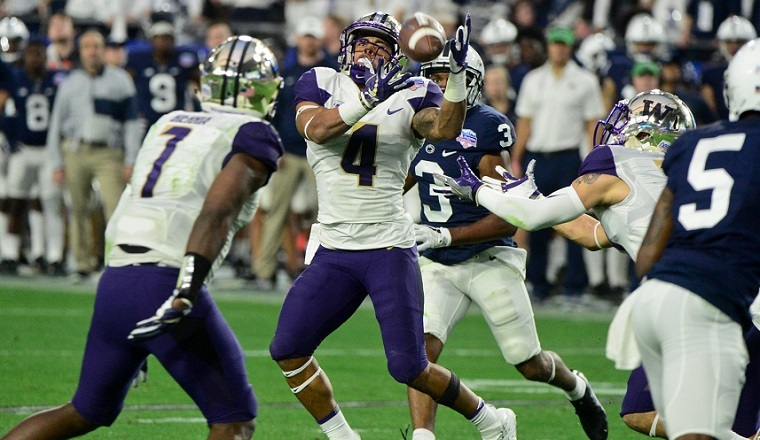 These two will be early Playoff contenders (or at least dark horses), and a win by Washington would do wonders for its chances — and the Pac-12 as a whole. The same applies to Stanford’s Week 4 trip to Notre Dame. That, of course, is the unanswerable question. On the one hand, the committee chose to throw every precedent about resume and quality wins out the window this year with its selections. So maybe a Washington or USC or Stanford — even with a dearth of quality wins (certainly in-conference) — could find a route to the Playoff by looking dominant throughout the season. On the other hand, the committee made its exception for Alabama and none of the aforementioned schools are named Alabama. In general, the college football world always has a tension between the perceived strength of teams and the shiny distraction that is an impressive win-loss record. When we get to the season’s end, those Pac-12 schools with less than two losses will be in the thick of the Playoff conversation. But they will have to work their way up through the rankings, as they won’t get much benefit of the doubt throughout the season. And, if things are close at the very end, the lack of ranked Pac-12 teams will probably not be a point in the conference’s favor. Yesh has been a fan and student of college football since before he can remember. He spent years mastering the intricacies of the BCS and now keeps an eye on the national picture as teams jockey for College Football Playoff positioning.